Is May a good month to vacation in Hawaii? Is the month of May a good time to vacation in Hawaii? We’ll examine the details, but I’ll quickly cut to the chase and let you know that May is one of the best times to go to Hawaii. The weather is generally good, occupancy is down and costs are relatively inexpensive. What’s the weather like in Hawaii in May? May’s weather is usually quite nice. Daytime high temperature average in the low to mid 80s F. Nighttime temperatures only dip into the lower 70s F.
The average ocean temperature starts to warm up in May and is certainly pleasant enough for swimming. For more details see our article on Hawaii’s ocean temperatures throughout the year. By May, average rainfall levels are dramatically lower as compared to the rainier winter months. The typical rain pattern in Hawaii is that most precipitation falls at night. Daytime showers are usually brief. Kauai – 2.07 inches – This measurement is based on Lihue’s averages per Weather.com. Lihue is located on the southeastern side of the island and is not as wet as the North Shore, but not as dry as the South Shore. Oahu – 0.99 inches – This average is based on Honolulu’s rainfall per Weather.com. North Shore rainfall will be a little higher, while Ko Olina’s rainfall will be slightly lower. Maui – 0.74 inches – This average is based on Kahului’s rainfall per Weather.com. Kahului is where Maui’s main airport is, but it’s not typically considered a resort area like Wailea, Lahaina, Kaanapali and Kapalua. Kahului’s rainfall tends to be a bit higher than all the resort areas, with the exception of Hana on east Maui. Hawaii, the Big Island – 0.71 inches – This average is based on Kailua-Kona’s weather per Weather.com. Kailua-Kona is a popular resort area. Further north on the Kohala Coast, the weather tends to be even drier with only about 10 – 12 inches of rain for the entire year! Hilo, on the east side of Hawaii Island, is another story though, with an average of 8.12 inches of rainfall for May per Weather.com. Lanai – 2.17 inches – This average is for Lanai City in Lanai’s upcountry/highlands, which tends to get much more rain that the island’s sunny, beach resort at Manele Bay. Data sourced from Weather.com. Molokai – 0.53 inches – This average, per Weather.com, is for the airport just west of Kaunakakai town. Weather towards the east side will be rainier. Is May a crowded time to visit Hawaii? As a whole, May is one of the least crowded months to visit Hawaii. Per our analysis of 2012 and 2013 Hawaii Tourism Authority visitor data, only the month of September was lower for the total number of visitors. Though May is generally very uncrowded in May, there are a couple of minor exceptions worth mentioning. Waikiki Beach can be a popular destination among Japanese people for Golden Week, which is a series of holidays starting April 29 and lasting through May 5/6. We have visited the islands during this time and we didn’t find them to be overly crowded. Memorial Day holiday (the weekend including the last Monday of May) is a fairly popular time to visit. Is May an expensive time to go to Hawaii? With the exception of Memorial Day weekend, May is an inexpensive month for accommodation costs per Hawaii hotel cost data from 2013. Airfare can be more difficult to predict. From our observations, flight costs aren’t outrageous for May, with the exception of Memorial Day weekend. See our strategies for finding the best airfare to Hawaii. Are there any special reasons to visit Hawaii in May? The first day of May is designated as Lei Day, which is a celebration of the Hawaiian lei and culture. 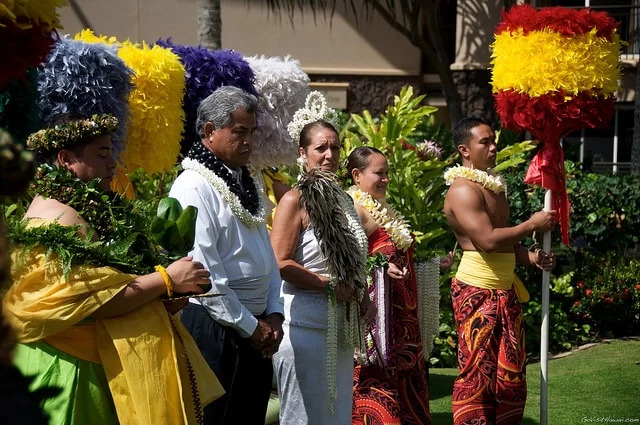 You’ll find various Lei Day celebrations throughout all the Hawaiian Islands. A Lei Day celebration on Kauai. – Waikiki SPAM Jam celebrates Hawaii’s love affair with SPAM. – Mele Mei is a monthlong celebration of the unique music of Hawaii. – Memorial Day is honored in Oahu at Punchbowl and via the Lantern Floating Festival. See our 2013 post for examples special events for Memorial Day in Oahu. – Kauai World Challenge Canoe Race is a 36-mile coastal relay race. – East Maui Taro Festival honors this staple plant. – Ka Hula Piko Hula Festival – the celebration of the birth of the hula. – Kaiwi Channel Relay is a 39-mile canoe relay race from Molokai to Oahu. Search for events on GoHawaii.com for additional festivals that may be happening during your stay. This article about visiting Hawaii is May is part of a larger series on how to choose the best time for a Hawaii vacation. Learn more about other months here. Have you been to Hawaii in May? Where did you go? How was your visit? May is my second favorite time to visit Maui, right behind September. I like the lack of crowds in those 2 months, and the weather is great – slightly more so in September. We’ve visited in March and June, and both were much more crowded, especially March, due to whale watching and Spring Break. March was also wetter than I like. May is great if you’re hoping for room upgrades at the resorts, because they have more openings, it’s easier to get dinner reservations, the beaches are less crowded, etc. The same for September. We were married in September on Maui, but my work and my wife’s garden make it difficult to get away in September, so May works best for us. But there is really no bad time to visit. We usually use points for hotels and miles for airfare, so the time of year is not so important when it comes to costs, although you sometimes get more out of your points/miles in these off-months. I have a 21 year old son in a wheelchair. need advice on the best places/sights to visit that are accessible and places to stay. He loves to snorkel and has a beginner dive certification. Have you selected an island? No. Just starting to look so any advice or guidance would be much appreciated. He has Friedrich Ataxia and uses a wheelchair but can transfer independently. Thanks! I try to make a mental note of accessible attractions whenever I visit Hawaii. Thankfully there are many! I think you can find great things to do no matter which one you choose from any of the four major islands — Oahu, Maui, Kauai, Hawaii (Big) Island. Take a few minutes to read through our how to choose the best island(s) for you to help direct you to the island(s) that resonate with you the most: https://www.govisithawaii.com/2010/06/28/how-to-pick-the-best-hawaiian-islands-for-your-vacation/ After you look through that, comment to let me know which island(s) you’re leaning towards. Maui and the Big Island are our favorites for snorkeling, but you can find good snorkeling on the other islands, too. Thanks Sheila! I think we are leaning towards Maui after looking at everything. This is a bucket list trip for us and we have been saving for a while. Any pointers on good deals? I want Josh to get the most he can out of the trip and love that Hawaii offers beach wheelchairs! You are awesome! Thanks again so much for all of the good information. We have a roundup of our best money saving tips here: https://www.govisithawaii.com/2011/01/25/top-tips-for-saving-money-on-your-hawaii-vacation/ Do you have a Costco membership? If so, we have found some of the very best packages for car and hotel on their travel website. I’ve literally been binge reading all your posts. We’re planning our first ever trip to Hawaii during May and our tentative dates are May 4-May 17. Oahu 4 days, Maui 4 days and Big island 4 days. We’re travelling from Vermont, so keeping in mind the expenses.. we’re planning to pack as much as we can during this trip. What are your thoughts? Do you think this is a good enough time to spend on the 3 islands? Thank you once again.. appreciate your inputs! Take a look at this article, Shraddha: https://www.govisithawaii.com/2014/01/14/how-many-islands-should-you-visit-during-your-hawaii-vacation/ What you’re planning is certainly feasible, but do consider all the time you’ll lose in transit. Thanks for the reply Sheila. We’ve changed our plans and we’re thinking of doing only Oahu and Maui.